The heater tank is made of a steel plate and tested by 0.9 MPa overpressure. The inner surface of the tank is provided (except the stainless coil) with anticorrosion protection of enamelled glaze. In the bottom part of the tank there are wells for placing the heating, regulation and safety element of the water heater (heating element with right thread G 5/4“, thermostat sensor and thermal fuses). A thermometer is installed in the top part of the heater that transmits information on heating the volume of service water. The heater tank is provided with a highly valuable polyurethane insulation which ensures minimum heat losses. Electric wiring is placed in the bottom part of the heater, under an easily removable guard of the heater (by loosening two screws on that guard). Temperature of water can be set by a thermostat within the range between 0°C and 77°C, using the symbols on the thermostat selector button Figure 1. Cold water inflow is indicated with a blue ring, hot water outflow is indicated with a red ring. All steel parts are protected against corrosion with paint and galvanic coating. 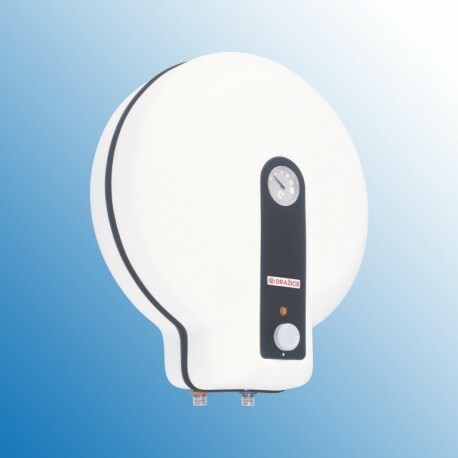 To ensure anticorrosion protection, the heating element head is provided with an anode rod that dissolves when the heater is in operation, and has to be replaced after 3 years of operation (depending on the aggressiveness of water). Consumption of hot water in households depends on the number of people, amount of sanitary equipment, length, diameter and insulation of piping in the flat, or on individual habits of users. The cheapest option of water heating comes at the time when the electricity rate is reduced.